I actually had this post planned for a couple weeks from now, but I didn’t want you all to miss out on this fabulous coat! It’s about to sell out, and let’s face it, it’s awesome. I found this embellished tweed coat on major markdown at the Tory Burch store in Dallas two days before I left for London. It was meant to be! Unfortunately it’s selling online like crazy, so it’s not yet discounted, but it is available for purchase here and here! Because the nights are pretty chilly here, it’s the perfect topper for nicer dinners out. While I won’t be able to wear it the entire time I’m here (it is tweed, after all), I will make the most out of it until it cools down even more in September. The subtle mix of colors among the crystal embellishments make this piece surprisingly versatile. I have so much grey, blush, blue and white already in my closet that it really has endless opportunities for wear. Did I mention it has a matching skirt? Beautiful, This coat is pretty incredible. I am loving the details in the look. 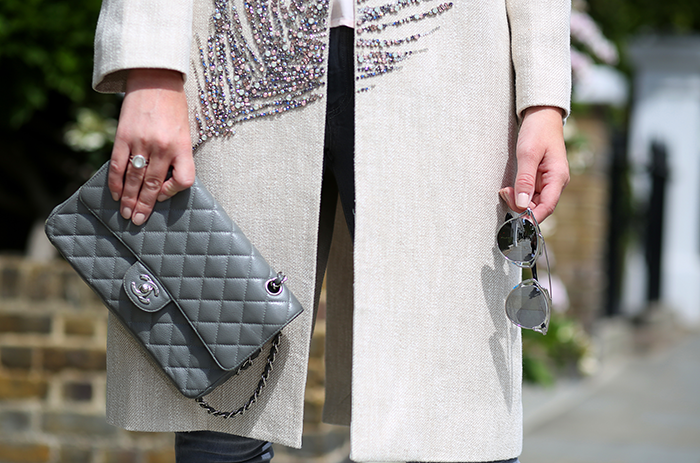 This coat is stunning, love the embellished details. What a gorgeous coat! I love the embellishment. It really makes it a special piece. The grey tones in this look are so pretty! That coat is gorgeous! Love the embellishments. Hope you’re having a great time in London. Obsessed with the detail on the jacket! Obsessed with this look! Looks like you’re having a blast — love following you! So chic!! OMG – that coat is amazing! Such a unique statement piece…great find!! okay…you WIN!!!! coat is amazing!!!!!! so lady like love…we need to catch up I want to hear how London is going so far!! omg omg omggggg this coat is EVERYTHINGGGGGGG! So stunning!!!! And love the clean styling. Ah, just obsessed. Cute coat, I can’t believe we’re already looking at them though! I’m excited for fall fashion, but I want to keep the summer around for as long as possible. I hope London is treating you well! You look fantastic in that tweed coat!! Cannot wait to see more of your adventures in London! You should make a point to get lunch at Gymkhana while you’re there – amazing Indian food and the house punch is killer. Merritt! I’ve missed your posts during my lengthy little unplugged session. I’m loving these grey tones, and simple white peplum! 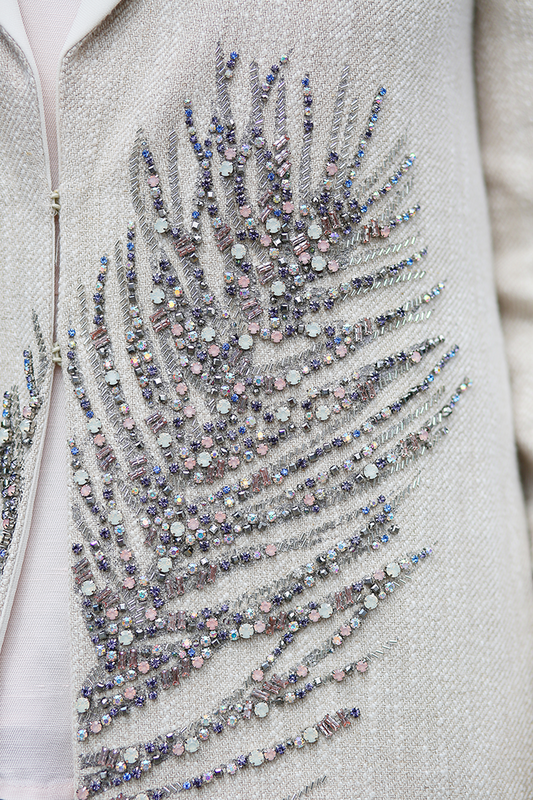 The detailing on that coat is absolutely beautiful! I must state my utter jealousy at you wearing a COAT right now…I’m in Phoenix, AZ which is about 8 billion degrees right and I would DIE to wear a coat. Okay maybe not die. But I’d maybe give a digit…maybe. That detail is stunning!! What a great coat! The detailing on that jacket is UNREAL! I didnt realize it was fully embellished. KILLER! Looks like London is treating you well! Love the details on the jacket. This coat is absolutely stunning! Also, I want to say I have been loving all your snaps from London! That coat is absolutely stunning. What a wonderful purchase you’ll have forever! The London Itinerary is live! !